New Year's Eve is going 8-bit this Dec 31 with electric piano trio The Fire Tonight at Iota. Once again joining them are well known DC folk/rock band The Beanstalk Library and also The Cowards Choir. Cover for the night is $20 and music starts at 7:30pm. 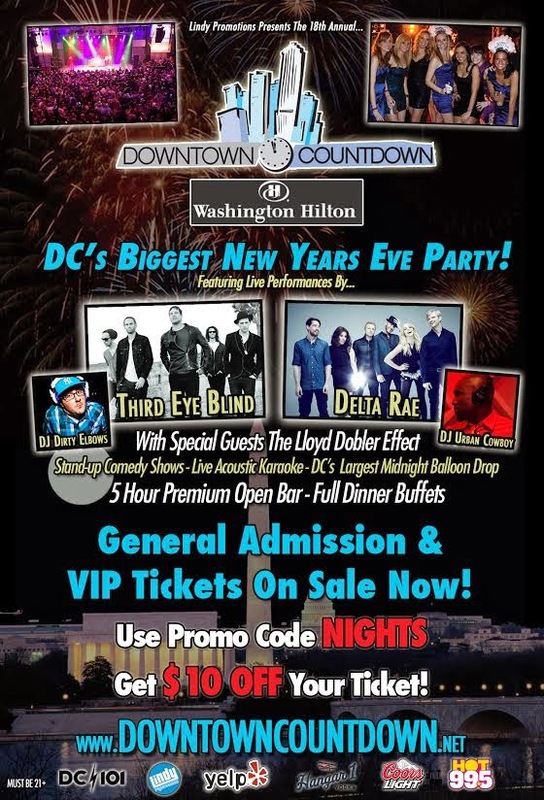 Lindy Promotions is again throwing a huge New Year's Eve party in DC this year with the Downtown Countdown at the Washington Hilton in DC. The night includes a five hour open bar (9pm-2am), dinner buffet, live music and DJs, comedians and karaoke to entertain 5,000 party goers. This year's full music line-up features Third Eye Blind, Delta Rae, The Lloyd Dobler Effect, DJ Urban Cowboy, and DJ Dirty Elbows. Use my promo code NIGHTS to get $10 off tickets, which range from $129 to $275. Special deals for group sales are also available. Sadly the fancy restaurant and rooftop Eventide suddenly closed one Sunday without warning. I wish I had a last chance at the excellent food in the second floor dining hall with the super high ceilings and booths with mini doors. Even worse this high end restaurant is planned to be replaced by Don Tito from the A-Town team, which sounds like it will be completely opposite of what Eventide once offered. 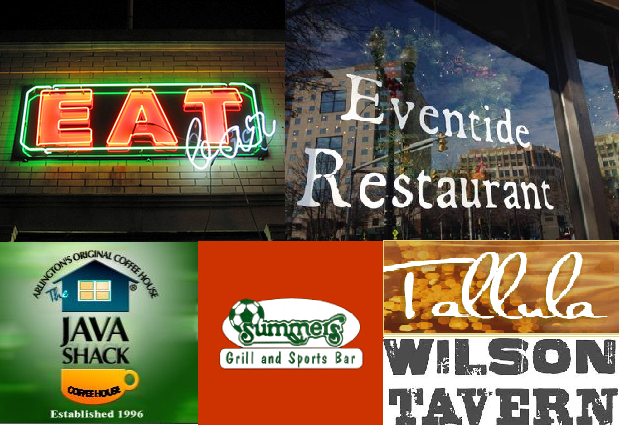 Twin quirky restaurants Tallula and Eatbar both shut down at the end of 2014. I enjoyed Tallula's menu, although it was often empty on that side of the building. Eatbar was a fun movie themed bar, but the food was overpriced and subpar and also suffered from being not close to anything. Texas Jack's Barbecue is set to take over the space in 2015. We lost Wilson Tavern in Courthouse to a new hotel project this past year. I was sad about that as Social DC PR just started throwing fun themed parties there and it was the spot to catch the last episode of How I Met Your Mother. Summers in Courthouse is set to close this year, and I have mixed feelings about the outdated soccer bar leaving us. It felt stagnant, but will miss the nights I spent there as a Marymount college student. Java Shack will be turning into Commonwealth Joe in 2015. I felt luke warm on Java Shack so I am optimistic about this change. And rumor has it that Carpool in Ballston my close in 2015 and may be demolished to make way for more high rise residential development. I hope that isn't true and we don't lose another quirky old favorite spot here. Jay's is the clear winner in 2014 as they are still open despite years of talk of closing and the upper floor of the building being deemed unsafe. 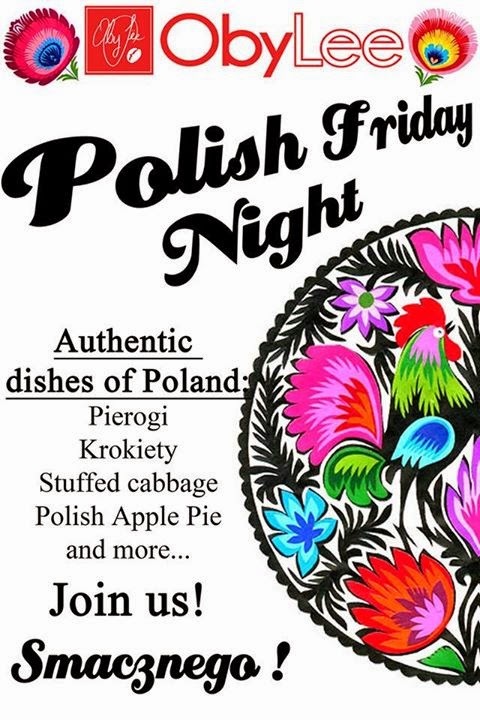 Bakery and winery Oby Lee is offering their first Polish night celebration this Friday, December 12. The Clarendon shop on the corner of Washington Blvd and 10th Street will serve traditional Pierogi stuffed with potatoes and cheese drizzled with mushroom sauce; Golabki cabbage stuffed with rice and beef with homemade tomato sauce; Krokiety crepe rolls with beef and mushrooms, and Jablecznik Polish Apple Pie. Oby Lee's Friday happy hour is from 4-7pm with $5 crostini.